What the Speedmaster Automatic ref. ST376.0822 (also referred to as the Holy Grail Speedmaster) was for Chuck Maddox, is the Speedmaster Professional Moonphase (ref.3689.30.31) for me. 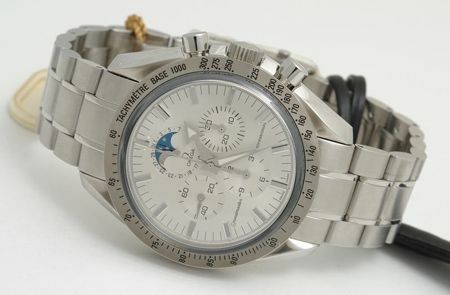 This white gold Speedmaster Professional (yes, labelled ‘Professional’) was introduced during BaselWorld 1999 by Omega. In the same year I bought my first serious watch, which happened to be a Speedmaster Professional (caliber 321) as well. The 18 carat white gold Speedmaster Professional Moonphase was only available for a limited time and commemorated the 30th anniversary of the Apollo XI landing in 1969. The caliber 1866 movement is based on Omega’s caliber 1861, which you probably recognize as being the handwound chronograph movement of the Speedmaster Professional. Caliber 1866 is based on Lemania caliber 1884, except that this one features a moonphase disc, a date and has a higher grade of finishing (as with Omega caliber 1863 used in the ‘Moonwatch’ models with display back). Although this watch is in essence the same as the regular Moonwatch, the silvered dial and moondisc (silvered moon in relief on a metallic blue disc) makes this watch something special. The look of the 18 carat white gold case probably won’t be noticed by anyone as opposite to stainless steel, but the weight of this watch is significantly higher ofcourse. I love the feel of this white gold watch, but I would be hesitant to wear this time piece on a daily basis, since white gold is a bit more vulnerable for scratches (even though I am a desk-astronaut ;)). The blued hands match nicely with the metallic blue moonphase disc. The date and moonphase can be corrected through the two pushers at approx. 10 o’clock, for which you will need a toothpick to set. The tachymeter bezel is like the regular Speedmaster Professional Moonwatch (ref. 3750.50), made out of black aluminum ring. This Speedy Moonphase in white gold was introduced (and delivered) with leather strap only. The single folding clasp is made out of 18 ct white gold ofcourse. 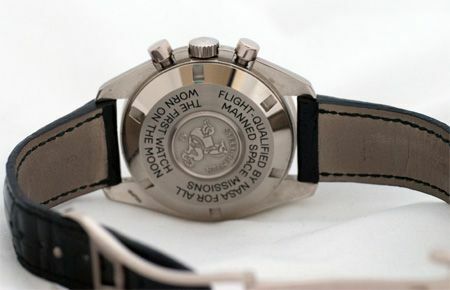 As you can see above, the caseback has the same ‘The First Watch Worn On The Moon‘ inscription as the stainless steel Speedmaster Professional 3750.50. You can ask yourself if this makes any sense, since this watch is really different from the official NASA EVA watch. However, the original Moonwatch differs from the current steel version as well. I could only find this watch in an Omega catalogue of 2000 which I had in my bookshelf. Later catalogues don’t include this watch anymore. 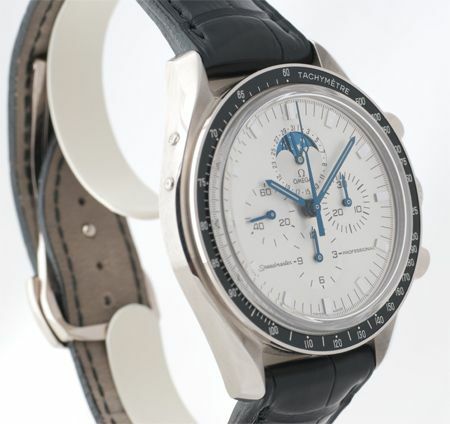 The original list price for the ref.3689.30.31 moonphase Speedy was 9890,14 Euro. However, at the time of introduction, the Euro currency wasn’t ‘live’ yet, so the catalogue also prints the price tag of 21.795 Dutch Guilders. A normal stainless steel Speedmaster Pro was 3495 Dutch Guilders at that time. So, having this watch here for a short period of time, only makes me want it more 🙂 A quick scan on the internet learns me however, that this watch still doesn’t come cheap (if you can find one). I actually found a few of them for sale, and the one I noticed needs to fetch 8.450 Euro (or 11.914 USD). I think that you actually could get some discount back in 1999 when you bought this watch, so the price level didn’t change much. A solid (gold) investment so to speak. 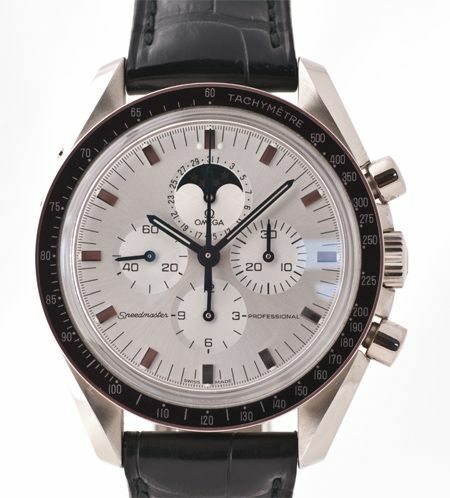 I believe that this is one of the rarest Speedmasters ever, perhaps as rare as the Speedmaster Automatic ref. ST376.0822 (Holy Grail), Teutonic Speedmaster Moonphase (ref. 3450810) or the gold BA 145.022 Speedmaster, given to the astronauts, president, vice-president etc. 8.450 isn’t exactly change for me, so I need to look at some alternatives. 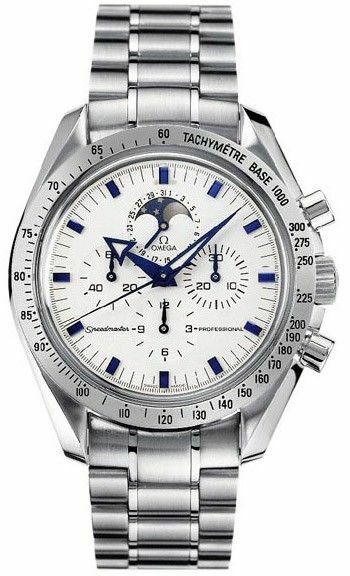 Ofcourse, I know about the current Speedmaster Professional Moonphase in stainless steel and the first one in 1985 (ref. 145.0809), but these models do have the same chique appearance that the white gold 3689.30.31 has. Luckily, Omega introduced another Speedmaster Professional Moonphase in 1999 called the ‘Speedmaster Replica Moonphase’, based on the Broad Arrow 1957 replica model. On a nice leather strap, it approaches the white gold version well enough. However, the only downside is that the blue hands are not as discreet as they are on the white gold Speedy Moonphase. As you can see, the bracelet needs to be replaced by a leather strap 🙂 However, the hour markers and hands are harder to replace. When the hour markers would be made out of white gold, it would be a lot better already. The dial looks awfully white here, but in fact it is ‘cream’ in the flesh. Omega’s catalogue photos didn’t do the watch any justice in 1999. This watch can be found in superb condition, complete with box and papers for below 3000 euro. List price was 4100 euro. In 2001, Omega introduced even a better version though. The Speedmaster Professional Moonphase (Broad Arrow, ref. 3575.30) of 2001 is a variation of the model above, but with silvered or white gold hands, hour markers and a stainless steel bezel inlay. List price and going prices are comparable of the 3575.20 above. Both models ofcourse have the Omega caliber 1866 movement inside, with the same grade of finish. Below, you’ll see a picture I found on the internet (somewhere) of the version I would love to own some time. And the price makes that owning this watch is more realistic than the white gold Speedmaster Professional Moonphase would be. Fact is that I really love the metallic blued hands, baton shaped, like the original Moonwatch has. The silvered hands are nicer than the blued hands on the Broad Arrow version imho, but I wonder how readable the dial is. The bracelet needs to go ofcourse. I never understood why Omega is using these bracelets for the Speedmaster series. The vintage bracelets tapered a bit towards the clasp, which gave it a more classic look. This bracelet belongs to the Seamaster line, or other diver’s watch. Thanks to Horloge Platform Nederland for lending me this white gold beauty! Make sure to read their review on this watch.